Since October 20, 2000, this page has been available online to quickly distribute to news media and others any documents filed with the Florida Supreme Court in Judicial Qualifications Commission cases involving alleged misconduct by Florida state judges or involuntary retirement of a judge due to serious illness. It does not include documents filed before this date. More information on the JQC and how to file complaints against Florida state judges is available at the end of this document. How Must a Complaint be Filed? Complaints can be filed using a Complaint Form provided by the JQC. Complaints cannot be filed with the Supreme Court, only with the JQC. For more information, check the JQC Website. Be sure to check out the JQC's webpage about Understanding the JQC Complaint Process. How can I check the status of a complaint I filed with the JQC? You should contact JQC staff at the phone number or address above. The Florida Supreme Court does not have access to these records. Can I E-mail a complaint to the JQC? No. See the JQC's Complaint Form for instructions. What Are the Ethics Standards for State Judges? The ethical standards for judges are called the Code of Judicial Conduct. They apply to all sitting judges. Canon 7 of the Code also applies to anyone seeking judicial office, such as in an election. The JQC can investigate complaints made by individuals, and it can investigate judges on its own initiative. During the initial investigation, the Constitution provides that all JQC complaints, investigations, and proceedings are confidential. The JQC can investigate a judge for misconduct if a complaint is filed at any time while the judge is in office and for one year afterward. The JQC can recommend that a judge be involuntarily retired due to serious illness that interferes with the ability to perform the duties of office. In these cases, the judge is not being accused of misconduct. Filings in these cases may be confidential under a state law protecting medical records of state employees. Who Is on the JQC? There are 15 Members of the JQC. Two must be district court of appeal judges chosen by all the judges of the 5 district courts. Two must be circuit court judges chosen by all the judges of the 20 judicial circuits. Two must be county court judges chosen by all the judges of the 67 county courts. Four must be registered voters who also are lawyers, chosen by the Board of Governors of The Florida Bar. The final five must be non-lawyers who are registered voters, chosen by the Governor. How Is the JQC Structured? The JQC is divided into two panels, an "investigative panel" that acts much like a prosecutor, and a "hearing panel" that acts much like a panel of judges reviewing the case. Judges accused of misconduct often are represented by a private attorney. When Do Proceedings Become Public? The Constitution specifically makes all ethical complaints against judges confidential. Confidentiality ends only when the JQC investigative panel files with the Supreme Court a Notice of Formal Charges. This is a public record and is the first public announcement that a formal investigation is underway. It is much like a finding of probable cause in a criminal investigation. However, this document alone does not give the Supreme Court any authority to commence proceedings of its own. Until the investigative stage is complete, the Supreme Court merely acts as the custodian of public records filed with it in the pending investigation. Any further action at this point will be undertaken by the JQC. How Does the JQC Hold Proceedings? The hearing panel of JQC will review the case against the state judge and hear competing arguments from both sides. The amount of time involved in conducting hearings varies greatly from case to case. Some judges agree or "stipulate" to some form of discipline, which means there will be no further proceedings and the case will go on to the Supreme Court for a final decision. However, the Supreme Court can reject these stipulations and has done so on some occasions in the past. If a judge contests the charges, more time and more hearings usually are involved. The JQC hearing panel schedules its own hearings. These hearings are not broadcast but are open to the public. They can be held anywhere in the state, usually near where the judge lives. When Does the Case Come to the Supreme Court? Once the JQC panel has concluded its hearings, it files its findings and recommendation for any discipline with the Supreme Court. If the state judge has stipulated to discipline, the stipulation also will be filed with the Court. The Supreme Court then must decide whether to schedule oral argument. Briefs can be filed with the Court before it decides the case. If oral argument is scheduled, it is announced in advance in the Court's Press Summaries, which are available on the Court's website. Video of the oral arguments is broadcast on the Supreme Court's Facebook Page. Why Doesn't the Supreme Court Impose Discipline as Soon as the JQC Makes Its Recommendation? The JQC only has authority to recommend discipline. This is only a recommendation, not a final determination. Final authority to determine whether the JQC's recommendation is legally correct rests with the Supreme Court after the parties have had a chance to make arguments according to the Rules of Procedure. This means that the parties have a right to file briefs making separate arguments to the Supreme Court unless the judge waives that right, to file appropriate motions, and to request that the Court schedule the case for oral arguments. What Kinds of Discipline Can a Judge Receive? What Other Government Bodies Can Discipline Judges for Misconduct? 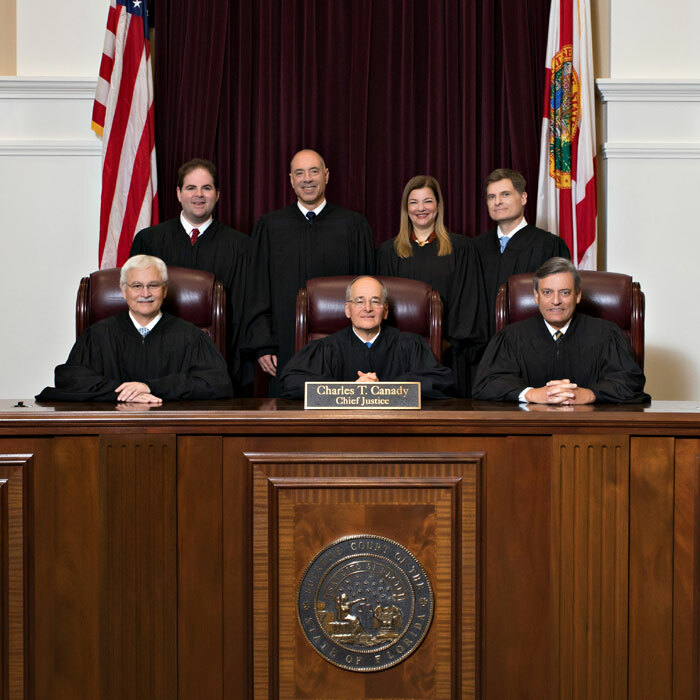 In addition to the JQC process, the Florida House of Representatives has authority to impeach judges, who then are tried for misconduct in the Florida Senate. Judges are removed from office by impeachment if found guilty by the Senate. Apart from impeachment, only the JQC can recommend forms of discipline, which must be approved by the Florida Supreme Court. There are no other methods of disciplining judges for ethical misconduct authorized by Florida law, although all Florida judges can be voted out of office in regular elections. Can Judges Be Suspended from Office While Under Investigation for Misconduct? Judges can be temporarily suspended from office while under investigation in only two ways. First, if a judge is impeached by the House and is awaiting trial by the Senate, an automatic suspension is imposed by the state Constitution. Second, the investigative panel of the JQC can ask the Supreme Court to suspend with or without pay while it investigates a judge. No other governmental entities can suspend a judge from office pending an investigation. How Can I Watch JQC Cases Before the Supreme Court? All of the Supreme Court's arguments are broadcast on the Supreme Court's Facebook Page, on the Internet, by satellite, and by some privately owned cable TV companies that show the Florida Channel. Private news organizations are free to pick up and broadcast the same video. Webcasts and Video Archives also are available via the Internet for free. Videotapes of the proceedings also can be obtained from the Court's broadcast contractor, the Florida State University Broadcast Center, by calling (850) 487-3170. Broadcasts and videotapes are only available for proceedings in the Supreme Court, not proceedings before the JQC. Is the JQC a Part of the State Courts System Administered by the Chief Justice? No. Article V, section 12 of the state Constitution specifically creates the JQC as a body independent of the state courts and the other branches of government. The JQC makes its own rules but is funded by the Legislature. The Supreme Court does not supervise the JQC, cannot investigate it, cannot fire or select its members, and cannot order it to perform any official act. How can I Complain about the JQC? Article V, section 12, of the state Constitution creates the JQC and specifies that its members who are judges can be removed through impeachment by the House of Representatives with trial in the Senate. Members who are not judges may be removed through the Governor's power to suspend public officials in certain instances. The Governor's power is described in Article IV, section 7. Thus, complaints about the JQC should be directed either to the House of Representatives or the Governor, or to both.